What Exactly is a Ccara Llama? 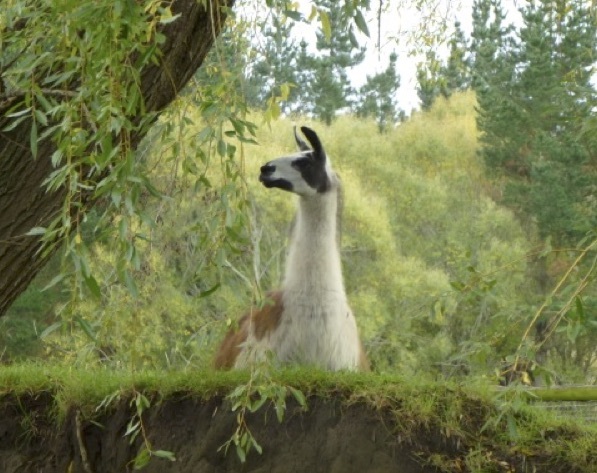 When I commenced my research into the history of llamas a number of years ago, I was at first surprised that the word for llama in both Quechua and Aymara is “KARA”. As the indigenous people did not have a written language, this was expressed in english by the Europeans of the day as ccara, cara, kara or q’ara from Quechua and frequently as qawra from Aymara. But no matter how we spell it in english, the point is that it is the word for a llama. So if we were to ask them what is a ccara, they would respond simply that it is a llama. And latterly when camelid scientists determined the llama to be a domesticated guanaco bred for traits suitable for that purpose, it became clear that there was only one type of llama at the beginning – the cara. Subsequently we have learned that a single coat llama was bred over hundreds of years from the cara, they called it the cha’cu, which is known to us today as the woolly. And at some other point in time, as far as I am aware the exact or even approximate timing of this is unclear, a gene mutation resulted in a suri fleece in the llama. So, at the start some 6-8,000 years ago there was the original llama the ccara, and from it was developed the woolly and at some point along the way was added the suri. 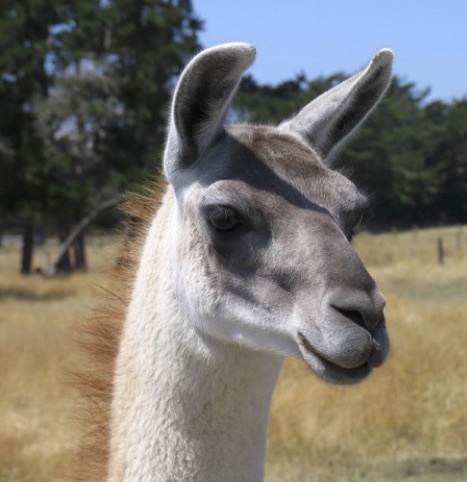 Now the original ccara llama was identical at the outset, to the guanaco. It had a distinct double coat, the coarse outer guard hair representing 10-15% of total hairs and an inner down of very fine fleece. It is further described as having bare legs to above both its knees and hocks, a bare face, bare ears and finally bare between its ears. It had short hair growth on its neck and the balance of the body was consistently covered with the guard hair/inner down combination. The ccara llama was proven to be able to survive in wet areas or total desert and at altitudes up to 4,000 meters and above, this fleece type being able to support the animal in all those conditions. The ccara llama sheds its fleece. It is constantly in the process of this, accelerating in the hotter months and slowing in winter but it never ceases. The entire fleece will replace itself after shedding every two years. 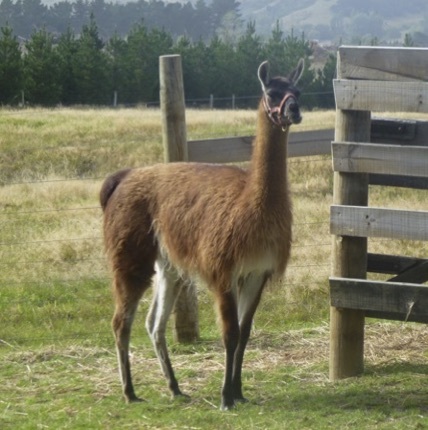 special to the ccara llama however the guanaco or original breed colouration may and will present itself on regular intervals. It is interesting that although there were three common fleece types, the physical integrity of the llama was the same, only the fleece differed. Today we have in evidence a number of intermediate fleece types resulting from interbreeding between the three fleece types. This is one of the major results from the chaos in years subsequent to the Spanish conquest of the Inka, the other significant introduced factor is cross breeding between llama and alpaca. These two developments (hybridisation and mingling of fleece types) make it difficult at times to determine exactly what type our llamas are today. Certainly if you have a llama which has a double coat and sheds fully, you have a fair chance of having a ccara, but you’ll find that many llamas in fact only partially shed often leading to an incorrect definition. One thing to look for is in regard to breed purity. Unfortunately the only way to conclusively determine if your llama is a purebred is to have DNA analysis undertaken. This is a very expensive and lengthy exercise at present, only a handful of scientists are capable of doing this. Until such time as this becomes more accessible to the average llama farmer, fleece coverage is the next best indicator, although it is not conclusive. The bare legs, face, ears etc mentioned above are what to look for. The other feature you may consider is fleece fineness. Contrary to a prevailing sentiment that llamas have coarse fleece, consider that the original llama, the guanaco, had very fine fleece, surpassed only by that of the vicuna which is recognised as having the finest fleece of any animal. Our llamas today which commonly have fleece testing in the 25-35 micron range do so as a result of cross breeding between the fleece types and hybridisation. Such llamas will reflect a deteriorating micron count from the age of two throughout their lives, whereas the original ccara llama will have fine fleece, normally less than 20 micron and that fineness will continue into their late teens. 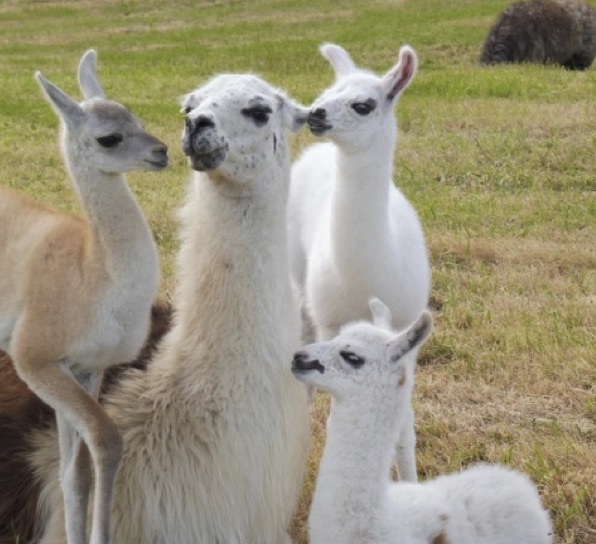 The ccara type of llama is certainly one which is ideal for smaller llama farmers. The ccara are low maintenance llamas requiring only a monthly brush to remove shedding fleece and never need to be sheared. As they are closer to the original breed they tend to have low maintenance toe nails in addition to a strong immune system as long as they receive a balanced diet.. Their fleece will be fine however the trade off will be quantity, with the ccara you will have quality but not quantity. They have a repute of being difficult to handle in some quarters however my experience is they do respond to proper handling when young and maintain that through their lives. They are a pleasure to work with. llama. Breeding to a male with coarser fleece is viewed as a backwards step in this initiative. Personally I support this practice, it makes sense to me. Progeny not only have finer fleece than the dam but often have improved conformation and structural integrity. Something to consider. AUTHOR’S NOTE: the ccara llama will not be for everyone, many will simply prefer the look of longer fleeced animals. We do however all need to be aware of the extent of hybridisation in our national herds and the importance of maintaining the integrity of the llama breed.